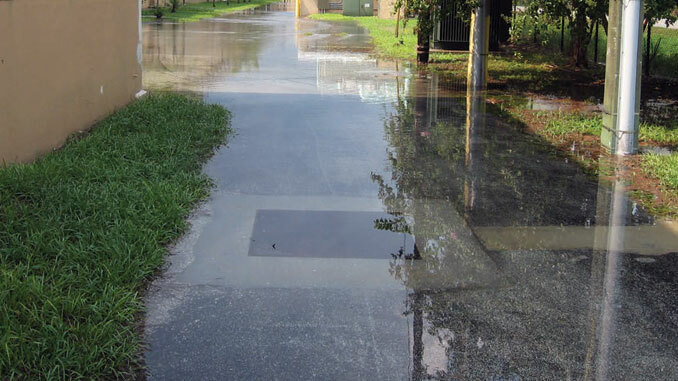 Aside from the immediate and obvious damage, flooding can impact well systems and aquifers for years. reflection of the large expanse, topographically, of rivers and coastlines as well as our historical tendency to settle homes and cities in floodplains and low-lying coastal areas. or containment structures, can also be responsible for flooding. Aside from direct damage to infrastructure or the limiting of access to well systems, one of the challenges our industry faces is dealing with the after effects of wells and watersheds that have been flooded. an extended number of years. • Wells with an abnormal affinity for bad luck. sure it is safe for use as drinking water. can weaken the structural integrity of a well, jeopardizing the sanitary seal. Any well that has been flooded should be viewed as unsafe for potable use until the well has been evaluated and tested. Floodwaters entering the well introduce not only surface water with drastically different water chemistry and microbiology, but also sediments and a variety of foreign contaminants into the well system. addresses the provision of clean water as a priority. Increased levels of bacteria and microorganisms and other “natural” contaminants like sewage and animal waste can be found in floodwaters. This contaminated water can enter the well casing through the top of the well or through defects and damage in the well’s casing or seal. Additionally, floodwaters can mobilize environmental contaminants beyond controlled areas, increasing risks associated with contact. One of the most common examples of this is the mobilization of hydrocarbon spills and the appearance of rainbows and oil films on the surface of the water. In addition to these health risks, floodwaters typically contain an elevated sediment load. Sediments found in the floodwaters can enter the well through vents and wiring conduits and cause mechanical fouling, increased wear of the pump components, and plugging of the aquifer. When addressing a flooded well, the first step is to clear access to the well. Depending on the extent of the flooding, this may be a minor or an involved task. Remove all debris from the well site, including any standing water. It is advisable to document this work, noting all damage as well as any containers that are present and visible discoloration of the water surface or vegetation. 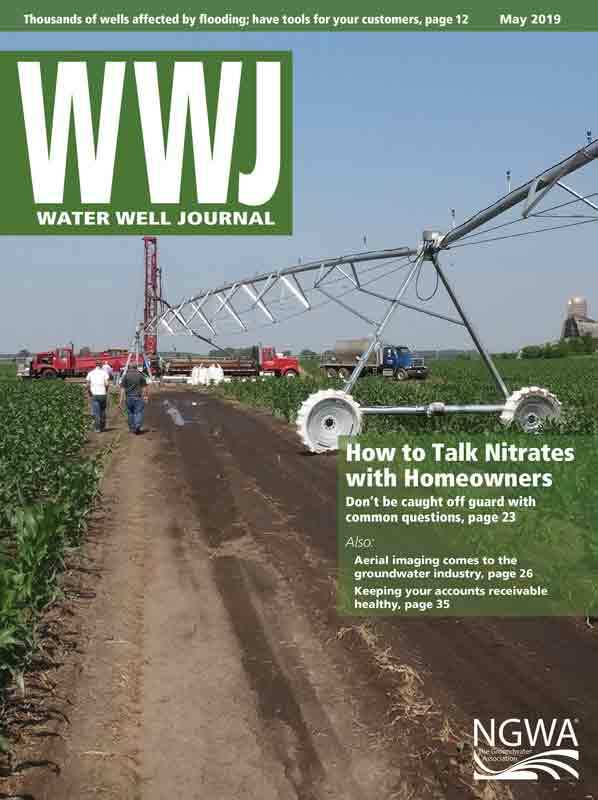 The National Ground Water Association has published 19 Best Suggested Practices. Among the topics are residential water well disinfection following a flood event as well as reducing problematic concentrations of iron and manganese, residential well cleaning, water well system inspection, and more. The BSPs are not standards but practices that have been demonstrated to show superior results. They are prepared by a consensus of groundwater professionals. Go to www.NGWA.org for more information. a significant danger of electrical shock, personal injury or death, and damage to the well, the pump, and the water system. and floodwater from the borehole. and floodwater depth and quality. As few as three hours and as many as 24 hours may be needed. It is recommended you purge the well until visual turbidity is gone and the conductivity has reached a normal level (typically less than 1000 mV). Visual turbidity is a means of evaluating a sample visually against an opaque background for signs of contamination or sediment. and column pipe should be evaluated for corrosion and material degradation that may have occurred as a result of the congested water and sediment present. wells to be chemically and mechanically cleaned before returning to service. If cleaning of the well is needed, balance the mechanical efforts with the structural integrity of the well. The chemicals used for cleaning should be selected based on the suspected fouling mechanisms present and the materials used in well construction. As with all well rehabilitation projects, the chemicals selected should be NSF Standard 60 approved for their use in potable well systems. After the well has been purged of floodwaters or cleaning efforts have been completed, a multi-volume, pH adjusted chlorination treatment is recommended as a means of disinfection prior to returning the well to active service. 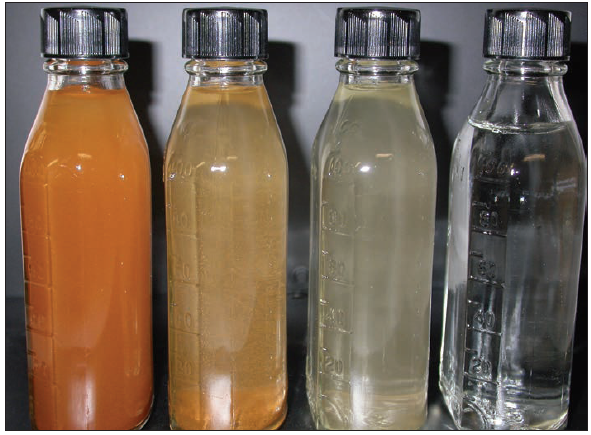 This set of samples show the progress made with pumping of a flooded well that sat out of service following impact. The sample on the far left shows heavy turbidity with a lot of iron oxide and sediment present. Pumping of the well over the course of several hours yielded the improvement visible in the samples, moving left to right. There are several commercially available products on the market that aid in buffering of the pH to an effective level during chlorination. Various products have additional benefits such as increased penetration of biomass and surfactant qualities to increase the zone of treatment. When choosing the best product, we recommend selection of an NSF-approved chemical that accounts for the water chemistry (pH and total alkalinity) and the strength and type of chlorine used to allow for best results. be agitated to disperse the solution all throughout the entire column. Swabbing of the well, cycling of the pump, or a pump-to-tank surging is recommended. Following agitation, check the chlorine residual within the well to assure sufficient strength is present. If the residual has diminished below 100 ppm, add additional sodium hypochlorite to raise it to that level. It is important to note if you are unable to maintain a chlorine residual during disinfection, this may indicate additional flood contamination remains and more invasive cleaning is needed. High levels of organic material, dissolved solids, and variable pH levels (all associated with floodwater) can degrade chlorine concentrations during treatment. Allow the chlorine solution to remain downhole overnight. The following morning, check the chlorine residual within the well to ensure sufficient strength has remained. If the solution has fallen below a 50 ppm residual, additional disinfection or cleaning may be necessary. Once sufficient disinfection has been achieved, begin evacuation of the well. Purge the well until the chlorine has been evacuated (total chlorine is <0.2 ppm) and all debris has been removed from the well as identified by visible turbidity. completed, the well should be returned to an active operating schedule as soon as possible and not allowed to sit idle for any extended period of time. If major structural damage has occurred to the well, or the well is substandard at inspection, or does not respond to chlorine treatment, more invasive cleaning, repair, or replacement may be needed. 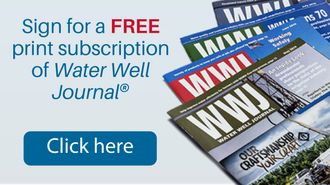 Although all wells should be periodically monitored and evaluated, it is especially important that follow-up evaluations be conducted on flooded wells. The evaluations should include periodic water testing to make sure disinfection (or cleaning) was sufficient, and no contaminants have impacted the aquifer and watershed and have migrated into the well. Additionally, within six months of the receding of floodwaters and again after one year, the well site should be evaluated for subsidence or other changes to the land within the vicinity of the wellhead. Flooded wells are often just one problem often during a deluge of problems that can have far-reaching impacts. Understanding the well and the steps necessary to get it back online are important. And the risk of problems from flooded water systems can be minimized if the risk is recognized and response plans are set in place beforehand. 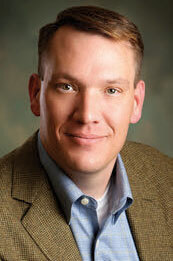 Michael Schnieders, PG, PH-GW, is the president and principal hydrogeologist at Water Systems Engineering Inc. He has an extensive background in groundwater geochemistry, geomicrobiology, and water resource investigation and management. He specializes in the diagnosis and treatment of fouled wells and potable water systems. 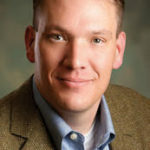 Schnieders is the 2017 McEllhiney Distinguished Lecturer in Water Well Technology. He can be reached at mschnieders@h2osystems.com.